NEW YORK -- Becca and her remaining three men arrived in Chang Mai, Thailand, for their fantasy dates. Becca said that she's in love with two of the three remaining men and falling in love with the third. So there are a lot of feelings involved. Her first date was with Blake. They met up on a jungle trail to find a temple. Becca told Blake they aren't allowed to kiss or touch once they start the trail so they got it out of their system early and then began their hike. They had some fun as they stumbled along the rocks until they finally found the beautiful temple. A guide helped them interact with the monks and learn how to pray to the Buddha. This part went on for a long time, too long actually. They wrapped up the first portion of the date by ringing a bell. Blake says that he's extremely scared that she feels the same way about the remaining men as she does about him. As night fell, so did the rain. Becca and Blake went to dinner to talk about their relationship. Becca told Blake that they are always moving forward and she never worries about him. She told him that she almost feels like it's too good to be true. Blake then expressed to Becca that he loves her more than his ex and that he's scared of the heartbreak that could mean for him. He told her he's scared that she could love someone else. Becca's face fell and she told him she understands. She didn't really say anything to make him feel much better about the situation though. Best line of their conversation: "I'm the kind of man who looks for a reason to stay, not a reason to go." Becca offered him the fantasy suite card, which Blake accepted. The next day, she woke up smiling with Blake and her makeup looked flawless. Becca said that she's feeling even more in love with him. Blake told her that she makes him nervous and makes his heart pound and he never feels that way. Becca told Blake that he seemed in his head, and he immediately got worried and told her that he doesn't want it to be the last time he wakes up next to her. They spent an extra long time saying goodbye, and Becca went off to meet her next date - Jason. Becca and Jason met up in the city with a big embrace and lots of kissing. They were going to explore the Sunday market. They got roses made of palm, watched some historic dancers, and tried the local cuisine. They actually ate crickets! Becca mentioned getting a house together and he talked about his condo in Seattle. Becca said that she couldn't see him in that picture anymore when she thought about the future. She completely started to freak out and started to cry. She told her fears to a producer and said it didn't make sense because she's having the best time with him. Nevertheless, they went into the evening and Becca tried to stay positive. They talked about her amazing time in Buffalo with his family. Jason said that his family gave her the stamp of approval. He told his parents that he loves her and that he's confident in his feelings. Jason asked her where her head is at, and she admitted her head is all over the place. She told him about her fears and her immediate thought that something seemed off. Becca started to cry and walked off. She wants to love him, but it seems she doesn't. She already feels like she can see the possibility of a future with Blake and Garrett, and she doesn't feel like it's fair to keep Jason around if she already knows. Jason sat there terrified until Becca returned to break his heart. She told Jason that he was very open to her and that he's pretty much perfect, but it's not 100 percent there for her. He urged her to push her boundaries and wanted to make sure she was confident that they wouldn't have a good future. Becca told him she's not confident, but she's more sure about the other two. Jason said why not give it that final bit of time, but Becca said she doesn't really have an answer for him because she can't explain what she's feeling. She told him she hates blindsiding him or anyone, but she said she doesn't think they can get there at the end. He gave it his best try. He told her he would always be rooting for her happiness. He gave her a very sweet hug and got in the limo and drove off. Becca felt awful about the whole thing. She said that he's such a good person and she can't believe that she let him go. The morning of her third fantasy date, Becca woke up alone. She tried to get out of her head so she could enjoy her time with Garrett. There's a lot riding on this though, she's down to just two men, but Garrett doesn't know that. They went riding on a bamboo raft down a river and it was a crazy time! The locals splashed them as they took part in a race of sorts. There were even elephants in the water! After their time rafting, they shared a beer and talked about how much fun they had together. Becca and Garrett also talked about what a great hometown date they had and how much his family liked her. Becca went into the evening portion of the date with the goal of finding out if Garrett is ready to commit to her. Garrett told Becca that he had a fear of going on the show because of his fear of things not working out. He said that her giving him the first impression rose just blew him away. He said that his fear grew because things have been getting more and more serious, but now he's not really scared anymore. Becca talked about how she made plans with Arie and never got concrete answers from him, so she wants to make sure she gets the right answers from Garrett. She flat out asked him how he sees their future. Garrett said that he can go anywhere with his career and he wants that to support her goals and dreams and meet in the middle if that helps her achieve what she wants. He's really giving her the perfect answers! Becca said that hearing what he went through with his ex-wife hurt her so much to hear that, but that he's back to himself. He told her he's never been this genuinely happy in his life and that he now realizes that he really loves her. He told her that he hopes that she's the last woman he ever has to say that to. They passionately kissed and Becca says that Garrett doesn't know it but she already loves him. She offered him the fantasy suite and he accepted! Garrett says that he can tell Becca loves him too by the way she kisses him. The next day, Garrett and Becca woke up blissfully happy in a tent. They both talked about how they could do this every day and she says she's happy they are on the same page. They seemed love drunk! But, as the clouds cleared, some drama would return. 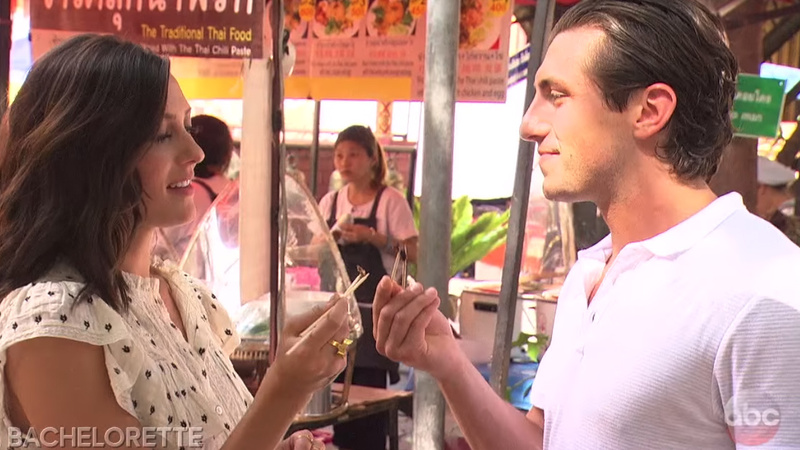 Becca envisioned just offering her final two men roses, but Jason was back! He wanted to fight for Becca or at least get some clarity. Jason got choked up as he talked to Becca and she apologized for how abrupt things were. Jason told her that his love was genuine. He wished her more happiness and Becca told him she wishes him well too. He told her he wanted to make sure they closed the door on their relationship in the right manner, and he gave her a book filled with photos of their relationship and all of his thoughts. Becca laughed and cried as she read it, but she remained steadfast in her decision. She just hopes that he finds his true love and said he deserves the best. Later, Becca took a motorized boat to the location of the rose ceremony. The guys told Chris Harrison that they love Becca and when she got her chance to talk to Chris, she revealed that she loves both of them and is going to have a tough week ahead figuring things out. Garrett and Blake were surprised to see that they were the only ones there. They both accepted the roses, knowing that it meant they would be meeting her family and were in the finale in the Maldives! Next week, it's time for "The Men Tell All." All the dirt will come out! Then in two weeks, it's at long last time for the big finale. Poor Becca clearly has a hard time letting one of the men she loves go, but she has to if she wants to find her forever person.